On August 18, 1987, there was a passenger excursion from Bellevue, OH to Columbus, OH and return behind Norfolk and Western Class A 1218. The train traveled on the Norfolk and Western mainline between the Lake Erie docks at Sundusky, OH and Columbus, OH. This was the largest steam engine I had ever seen in service, and was the first and last time I saw 1218 run. She hasn’t run in years, and may never run again. You can click here to learn more about N&W 1218. She’s currently at the Virginia Museum of Transportation in Roanoke, VA not far from her birthplace. Chasing a steam excursion on the flatlands of west-central Ohio is much different than chasing a steam excursion in Western Pennsylvania. Let’s just say that the hills and curves make this a lot easier to do on Sand Patch, the Wheeling Pike, and Sand Patch! You’ll note that this was another gray sky day. The more that I scan, the more it seems like Mr. Blue Sky had most of the same days off that I did in the 1980’s. In deference to the gray skies, most of this gallery has been replicated in black and white. It’s more complimentary to the gray sky, and steam locomotives in general. The black and white emulates Kodak’s Panatomic X film. It was so gray this day that I shot the originals on Kodachrome 200 slide film. The Mail Pouch Barn at Attica Junction appeared in many photographs in the 1950’s, as this line was originally owned by the Pennsylvania Railroad and it was one of the last bastions of Pennsy steam. Things had grown in somewhat since the 1950’s – probably because there was no ash and related “stuff” from steam engines to kill the vegetation – so it was it a very tight shot in 1987, and not at all what I’d hoped for. I checked Google Earth before finishing this post, and not surprisingly, the barn is gone. None of these shots are in my honest opinion going to grace a wall in large format, but they’re more than suitable for a mug, water bottle, or small print – and for your enjoyment. 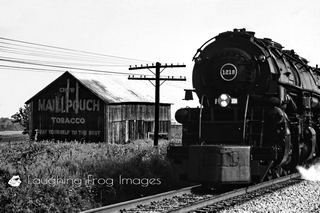 Enjoy a look at N&W 1218 in the N&W 1218, Bellevue to Columbus gallery on Laughing Frog Images.